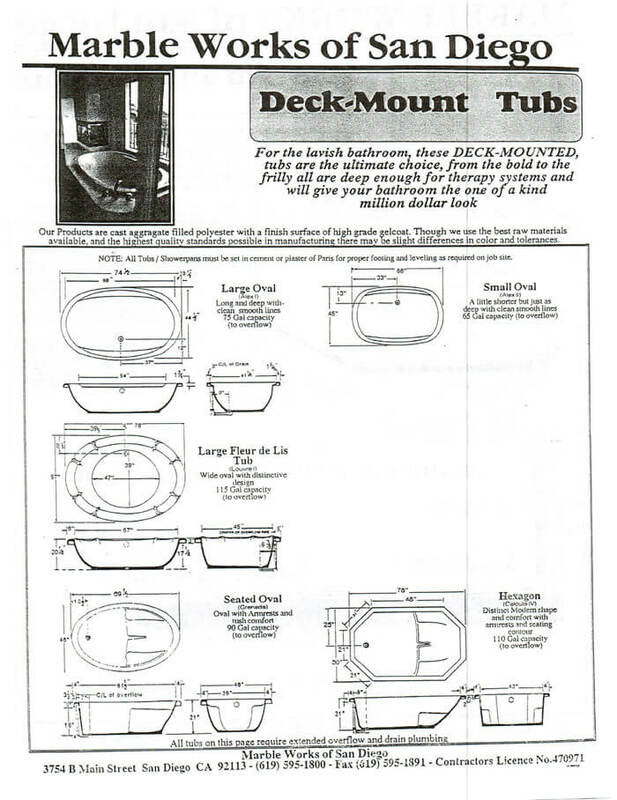 For the lavish bathroom, these Deck-Mounted tubs are the ultimate choice. From the bold to the frilly, all are deep enough for therapy systems and will give your bathroom the one-of-a-kind, million dollar look. Our products are cast aggregate-filled polyester with a finish surface of high grade gelcoat. Though we sue the best raw materials available, and the highest quality standards possible in manufacturing, there may be slight differences in color and tolerances. Note: All tubs/showerpans must be set in cement or plaster of Paris for proper footing and leveling as required on job site. We just wanted to tell you how great our new marble shower and countertop are. Your crew did an excellent installation job. They also did a great clean-up afterwards. We are surely enjoying it. Many thanks - you are a pleasure to do business with.